AdWords Express, formerly known as the limited beta version “Google Boost,” is a simpler version of Google AdWords. It is an online service for local businesses looking to generate local customers. With AdWords Express, small business owners can enjoy the benefits of targeted online campaigns without having to spend too much time creating and managing them. Unlike AdWords, AdWords Express will automatically recommend keywords and bidding amounts. All the business owner has to do is to enter the category, write the ad description, and provide a landing page (website or Google places page). The rest is done by AdWords Express. How does AdWords Express really work? When people search for the products and/or services you provide in your area (e.g. 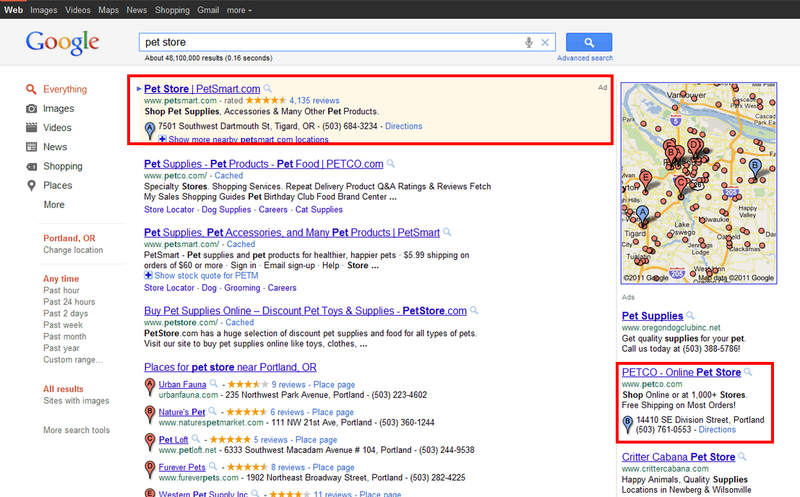 “Pet store in Portland” or just “pet store” while already in Portland), your ad will appear beside or above their search results on Google.com, Google Maps, and mobile devices. Your business will also be marked with a blue pin on Google Maps, making it stand out among the crowd and appeal to potential customers. What does it take to get started with AdWords Express? A mailing address is required. (You can choose to hide it by making it private if you work from home or just don't want to share your address.) You don’t need a website (although we think you do, and we can certainly help you get one!) But if you insist on not having a website, you can at least create a Google Places page, which AdWords Express helps you set up if you need assistance. As mentioned above, no experience in online advertising is necessary, and you will be able to create your ad and generate keywords and bids on your own. You will need to determine how much you’re willing to spend, and once again, AdWords Express comes to your rescue by automatically estimating how many clicks you will get for any given budget. You can control your budget and change it any time. AdWords Express optimizes your ads to get the most out of your advertising budget. The good news is that you only pay for clicks. The rest of the time you get free exposure every time your ad is displayed. You will be able to access your performance data from your Google Places account and view your AdWords Express dashboard. Personally, I think AdWords Express is a great way to get fast and affordable traffic to your local business as long as you have a killer website rather than just using your Google Places page as your landing page. When I shop around for services or products, I like to see a good website that represents the business and includes information about the company itself, the services and products offered, service rates and prices, and any other pertinent information I need to make a decision. If you do prefer to leave the search advertising to the professionals, give us a call. We can research, create, and manage your complete Google AdWords campaign and give you that brand new website you want.